The 899 Coulometer is the most compact and flexible Coulometer yet from Metrohm! Besides a footprint the size of just a DIN A4 sheet of paper, it comes with a Power Box for its own independent power supply! Coulometry is the ideal method for water determination in fluids, solids and gases when it comes to water determination in the trace range (10 µg to 10 mg absolute water). Moreover, coulometry is an absolute method and thus no titer determination is necessary. Coulometry to go – 899 Coulometer determines water content wherever you want! 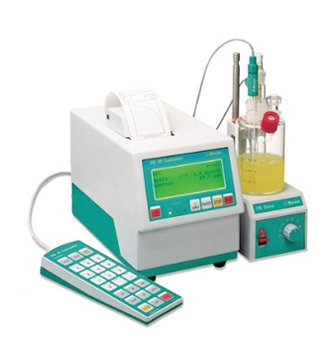 The 899 Coulometer does not need much space because it has its own magnetic stirrer built in. There is no need for a support rod either. 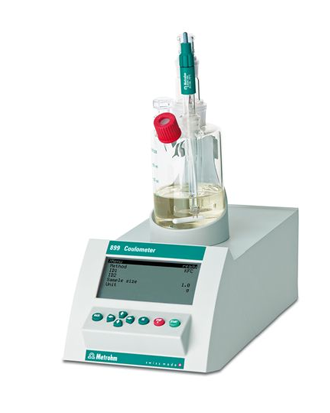 An integrated holder keeps the titration cell safely standing on the upper side of the instrument. No socket around to plug in the power cord? No problem with the 899 Coulometer. In this case, users can rely on the instrument’s independent power supply that comes with an optional Power Box containing a set of rechargeable batteries. This means users can perform coulometric determinations of the water content almost anywhere they want! At the same time, the 899 Coulometer provides the capabilities of a full-grown Metrohm Coulometer. Thus, it can be linked to a manual oven (860 KF Thermoprep) or to an 885 Compact Oven Sample Changer for fully automated thermal sample preparation and subsequent coulometric determination of the water content. Inexpensive coulometer including titration cell and generator electrode with diaphragm. It has become indispensable in many laboratories thanks to its reliability, its backlit graphical display, the multi-language dialog and the simplicity of its operation. The clear display provides information regarding the relevant titration parameters and unambiguous indication of the progress of the titration in the form of a curve showing µg water over time.Recommended measuring range: 10 µg - 200 mg absolute water. Model 756 features a built-in printer. 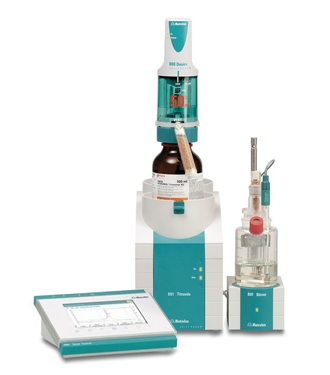 These Karl Fischer coulometers ensure accurate and reproducible results, even for water contents in the lower microgram range. They feature a compact design, flexibility and easy operation. The large LCD screen provides a clear view of the parameters, and it also displays the live curve in microgram water versus time. Both models come equipped with two RS-232C interfaces, which allow communication with a balance, external printer and/or PC; Model 756 features a built-in printer.